With the wireless eLECT system, the Vyron can be raised and lowered at the touch of a button. A redesign of the interior system resulted in a 25% improvement in the reaction time and the extension speed of the 2018 models. So the right seatpost is available for every frame. No cables, no problems – the Vyron is very easy to assemble and is ready for use within a few minutes. Hydraulic clamping and Royal Blood mineral oil make the Vyron a totally care-free package. Adjustment: Air spring, hydraulic clamping via Magura Royal Blood. Remote Operation: ANT+ wireless radio transmission from the handlebar via an eLECT remote. Length (overall) - 446 mm. Diameters available - 30.9 mm & 31.6 mm. Installation height - 57-207 mm. Charging time - approx. 3h. Battery Power - approx. 400 operations. Remote Trigger - Wireless Remote Control. Wireless Remote: The Magura Vyron Elect Wireless Remote Dropper Post utilises Magura's eLECT Remote with ANT+ wireless technology. You can mount the wireless remote on either side of your cockpit. If you also have a Magura suspension fork and/or shock unit with eLECT functions on your bike, you can choose what you prefer: one eLECT remote for the Vyron wireless dropper post and another for forks and/or shock(s) – or you can use all three buttons on a single remote to control every aspect. That's full bike control at the touch of a button. 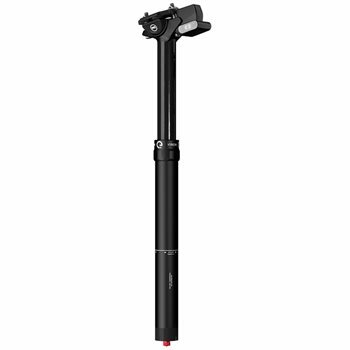 Rechargeable Battery: This wireless dropper seatpost has a rechargeable battery that needs topping up after approximately 400 actuations. It contains a motion sensor that puts it to sleep mode to save battery power when the bike is not moving. The battery will recharge from empty in around 3 hours via the micro USB port.